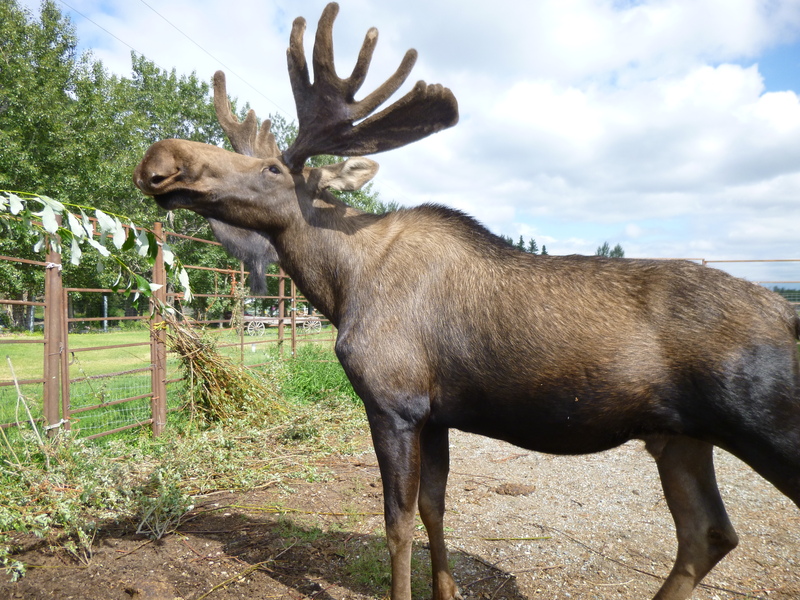 Alaska Veterans and Pioneer Home…and Reindeer! Toni and I headed out for breakfast, and afterwards, while she caught up with some stuff, I headed out for a walk, and covered 3 miles all around Palmer. 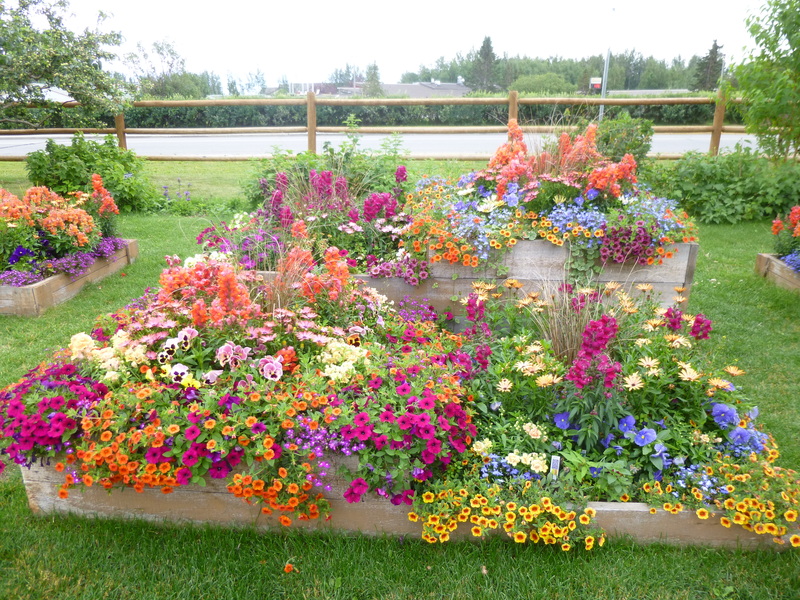 I wandered through a big garden by the visitor center, and read about the world-record produce that comes out of this valley. 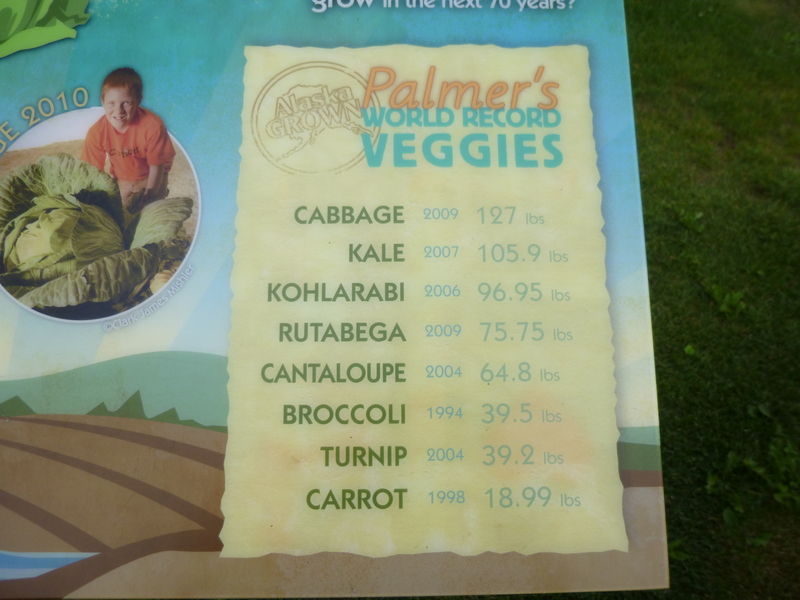 The combination of old glacial soil/silt, and 20 hours of summer daylight each day makes perfect growing conditions for record-setting veggies. 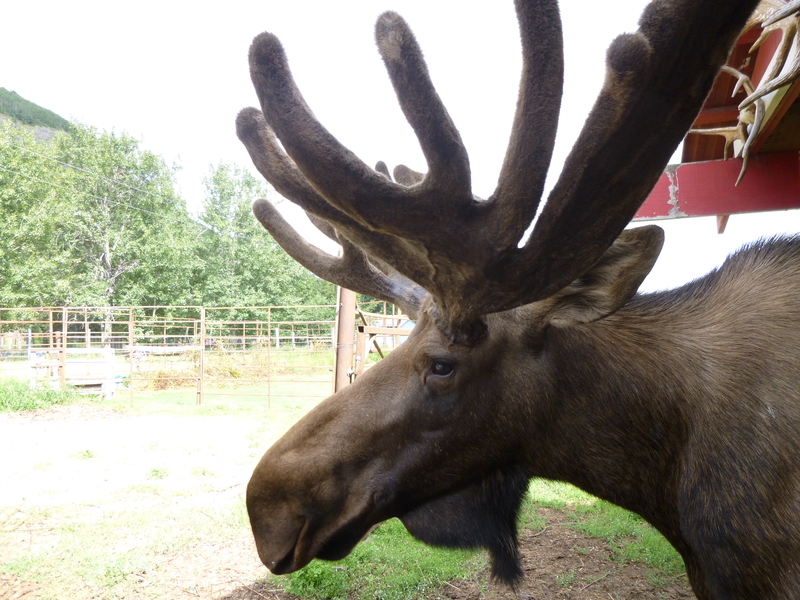 The Mat-Su valley holds the world record for cabbage (127#), carrots (18.99#), cantaloupe (64.8#), broccoli (39.5#), rutabaga (75.75#) and others. 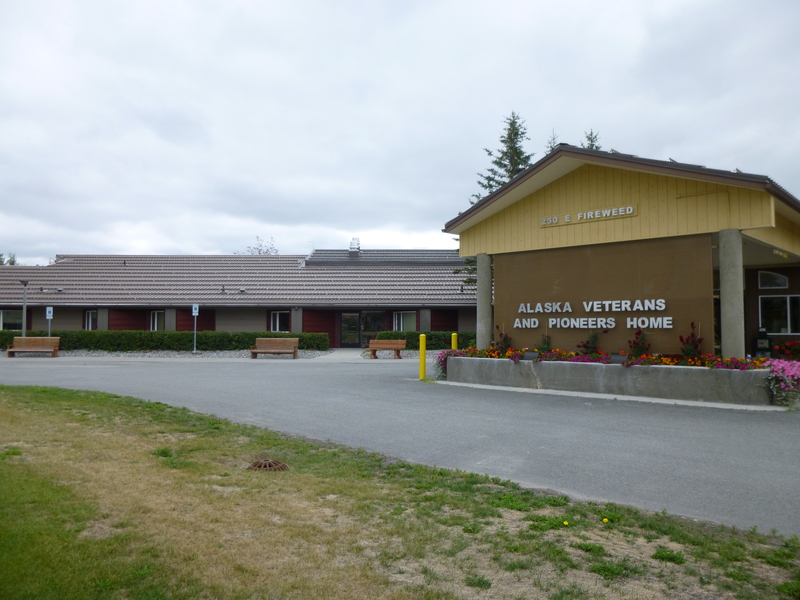 I also walked past the Alaska Veterans and Pioneer Home, which is the only veterans home in Alaska, and it didn’t even become that until 2004, when they went through extensive renovations to turn the pioneer home into a government-approved veterans home. 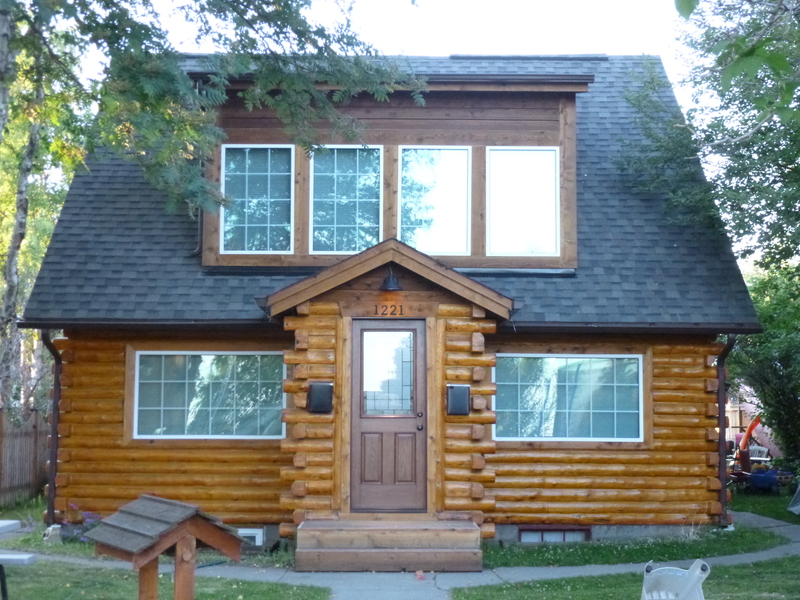 75% of the beds there are set aside for Alaskan veterans. 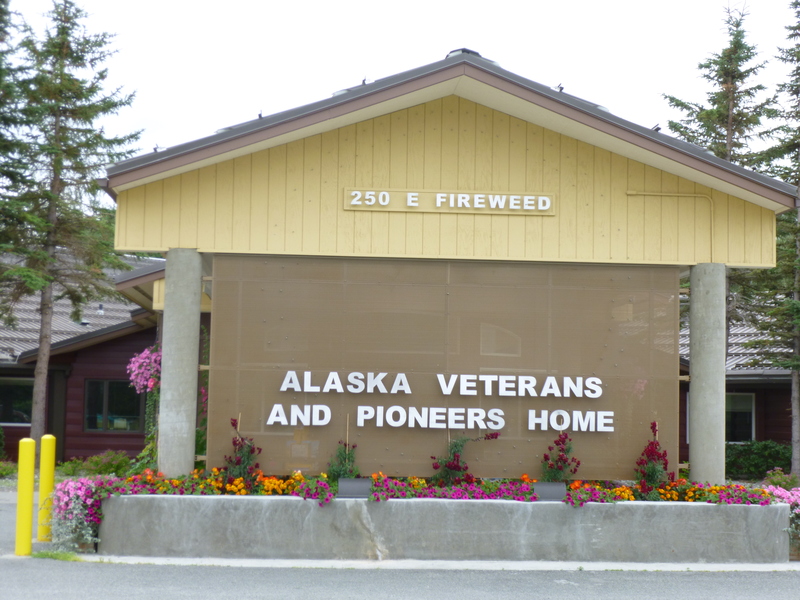 It seems that a lot of nursing homes in Alaska are called pioneer homes, and it makes me wonder if the oldsters living in them were the Alaskan pioneers since it didn’t even become a state until 1959. 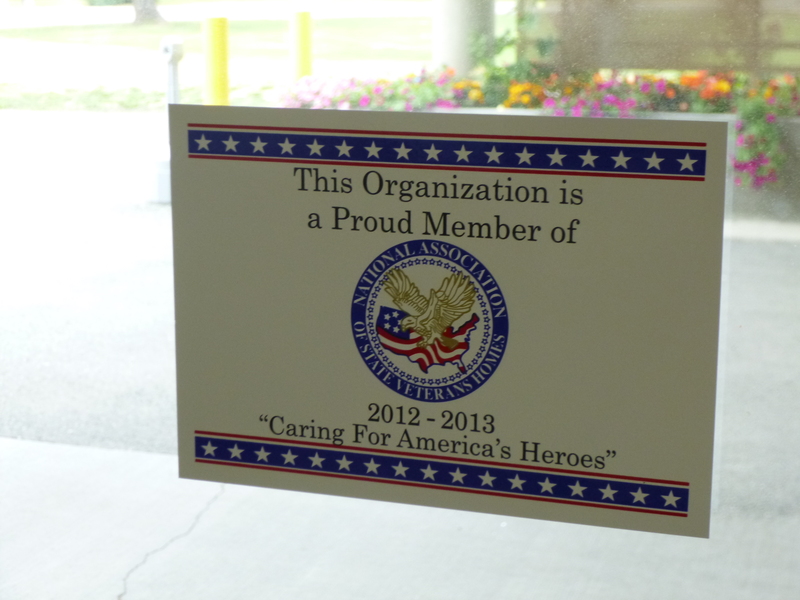 After I was finished with my walk, I called the veteran’s home, but since it was Saturday none of the administrative staff was in, so I just drove over and popped my head in to see if I could see anyone, and while I saw a couple nurses helping people in a room down the hall, I didn’t want to disturb them, so I decided to just mail the donation in since I won’t still be in Palmer on Monday. 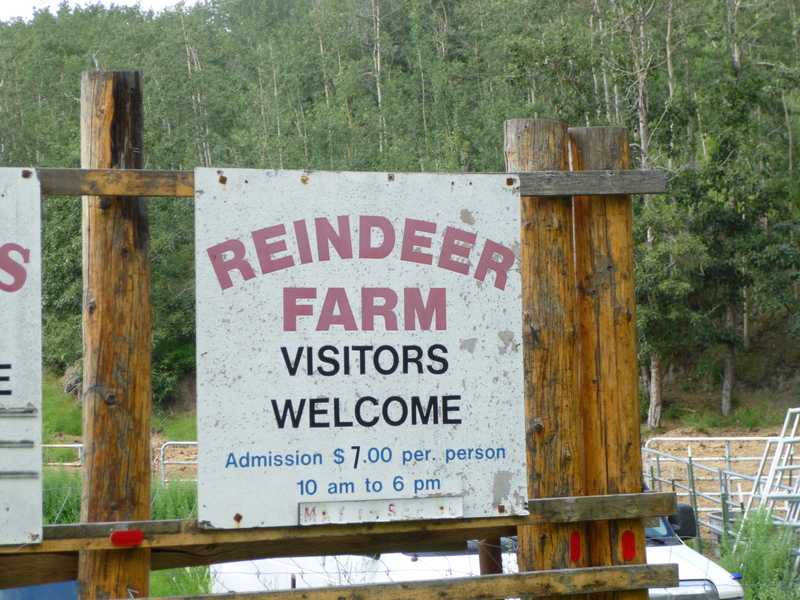 Then I wanted to visit the Reindeer Farm, which wasn’t too far from the musk-ox farm. Toni and John decided they better start getting gear and stuff organized for their multi-day camping trip, so they decided not to come. I enjoyed my visit there. 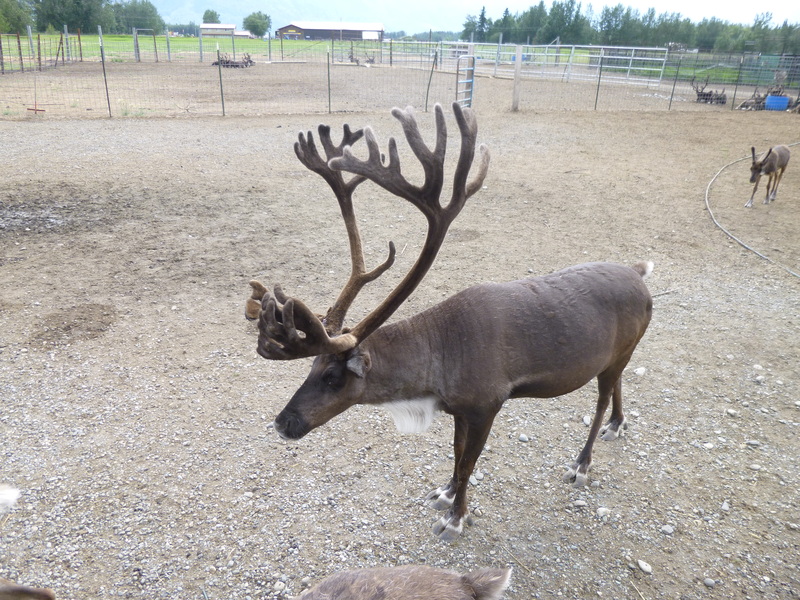 I think what surprised me most was how small the reindeer are (they told us reindeer are just domesticated caribou) and how big some of their antlers are – they seem too big for their bodies! 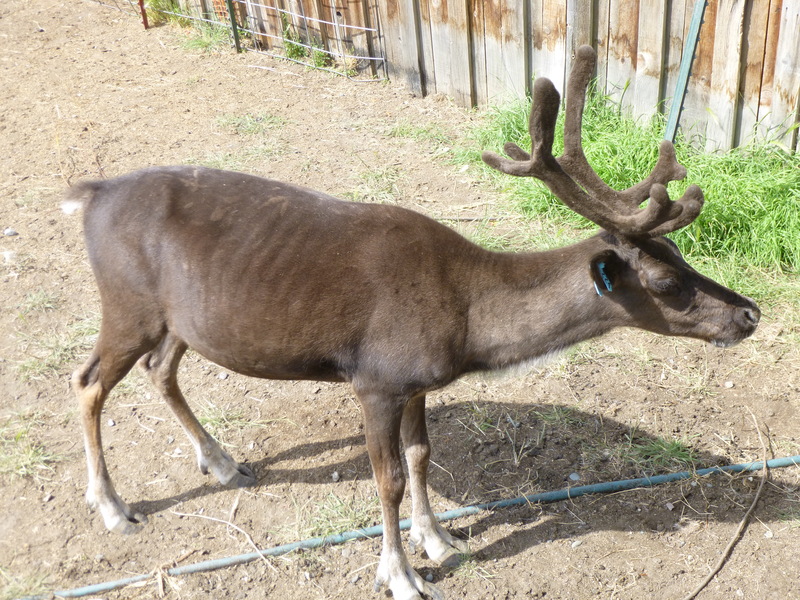 They also look velvety soft, and although we were allowed to go into the paddocks to pet them, we were told to not touch the antlers. 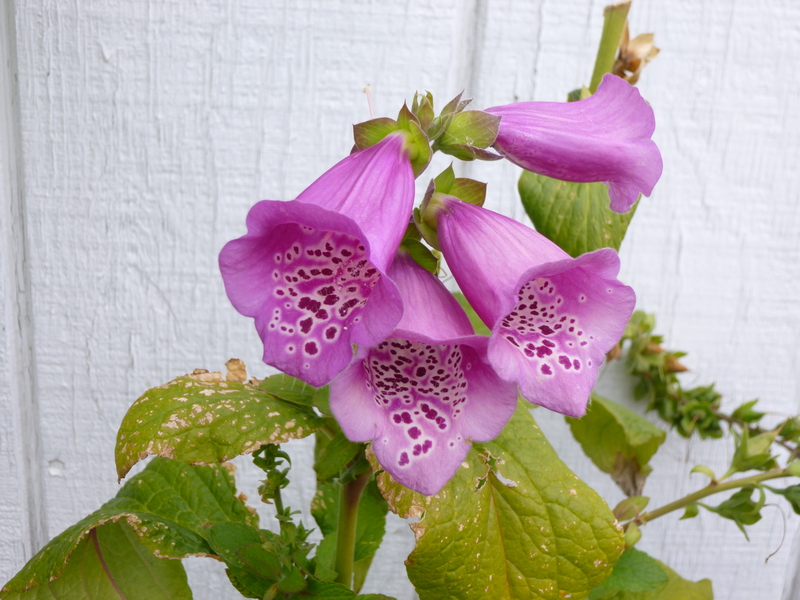 At this stage of growth there are a lot of nerve endings in them, and they’re very sensitive. 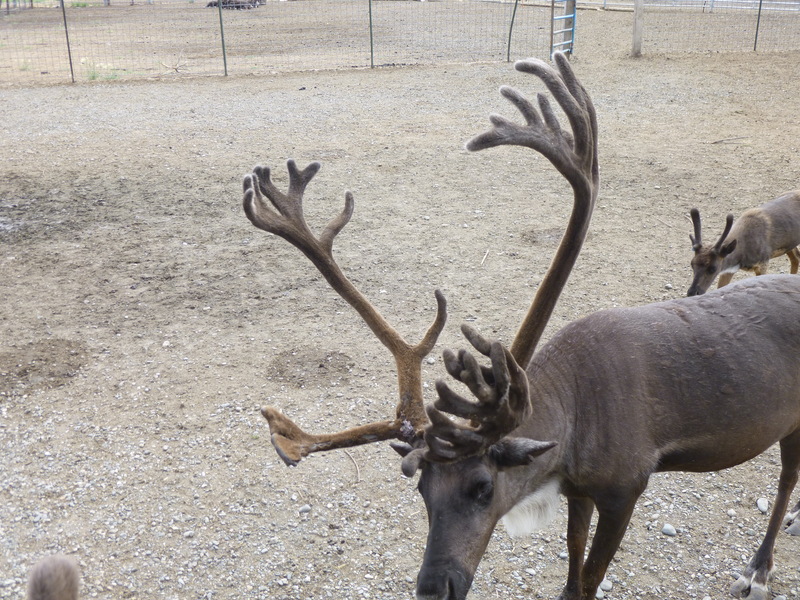 If someone squeezed an antler, it would feel like a human slamming their finger in a car door. 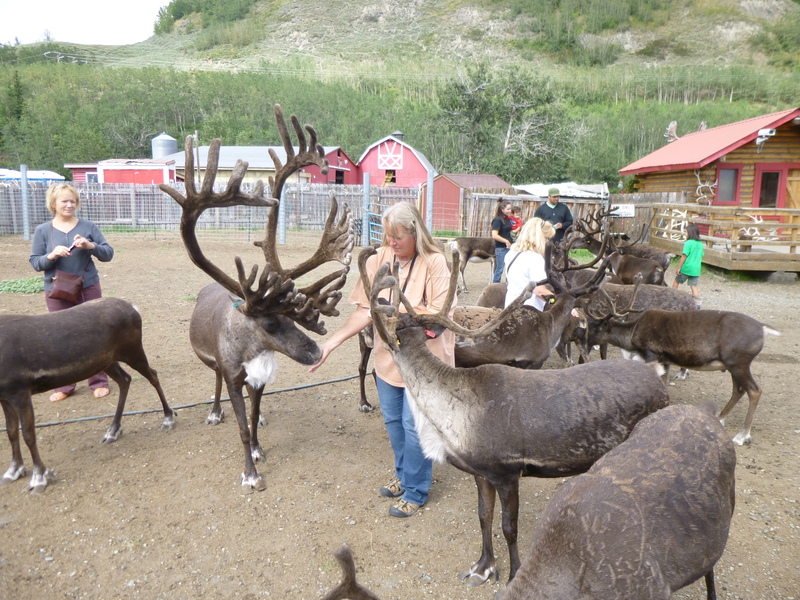 We all got little cups of food and scattered out among the herd of reindeer to feed them. They can be quite pushy, and they know exactly what is in the little cups. But they don’t bite – they don’t actually have front teeth. 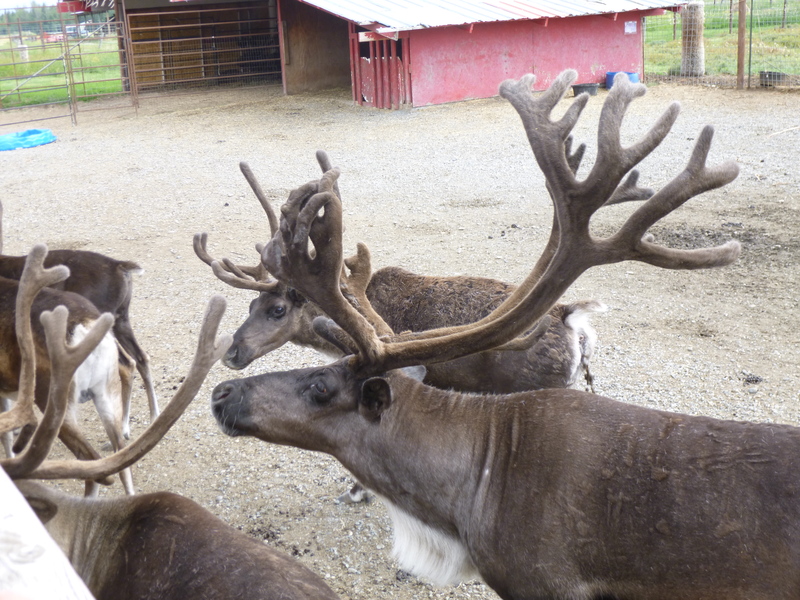 So it was kind of fun to be surrounded by reindeer! 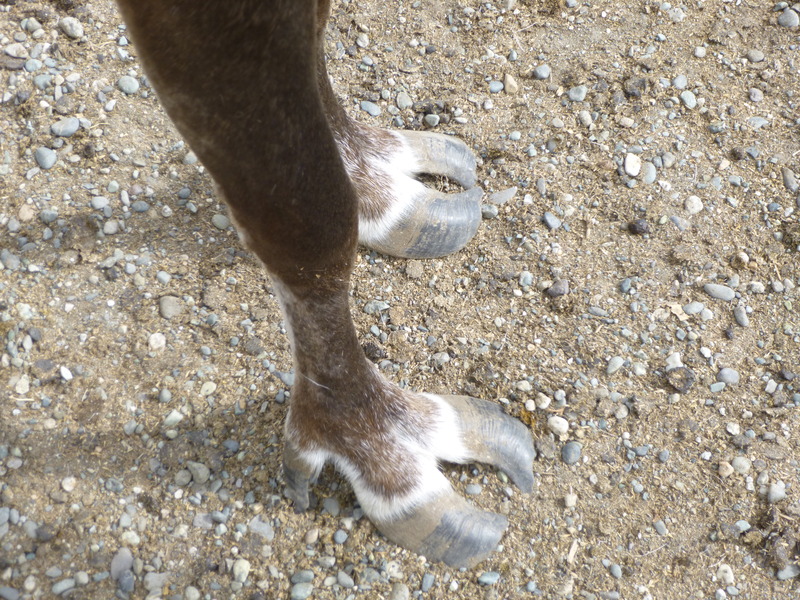 After my visit to the reindeer farm, Tula and I took a mile walk along a river. 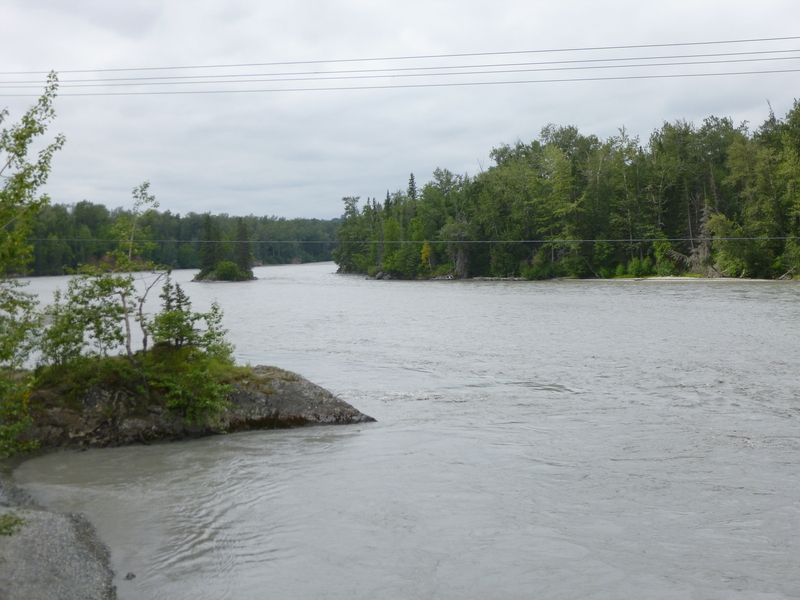 There are some really wide river beds which are mostly dry; yet there are also lots of rivers flowing fast with snow melt, so I don’t quite understand that. 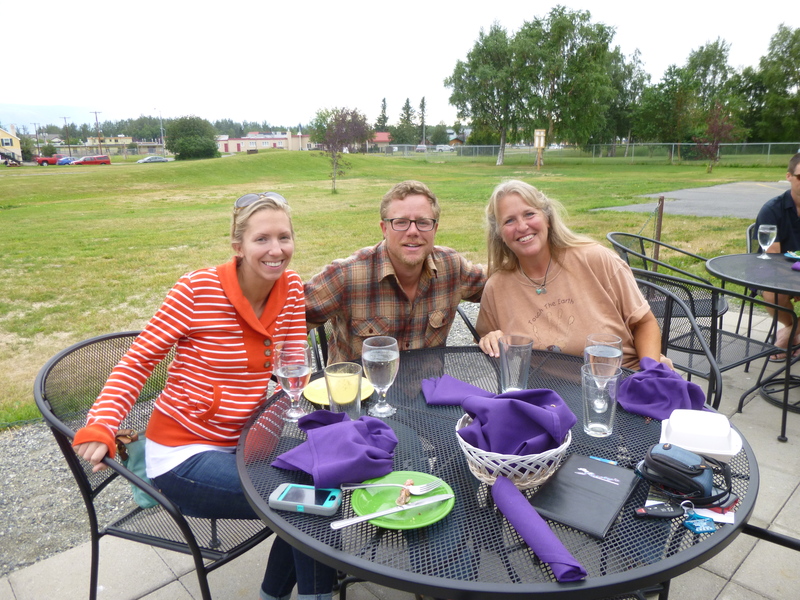 Then I headed back to NOLS and spent a little time with Toni, then she and John and I went out for dinner before we headed in our separate directions. 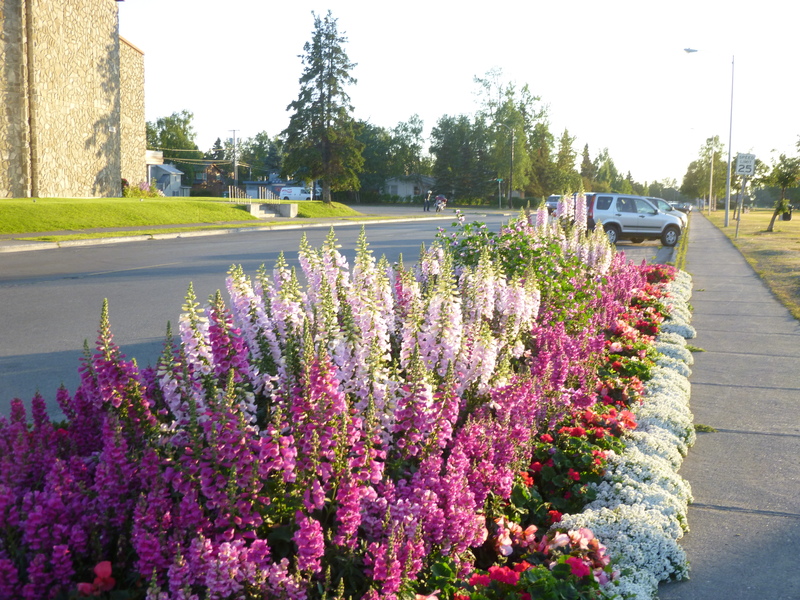 They were heading off for a camping trip in the morning, and I was going to start making my way down to the Kenai Peninsula this evening – saving one of my favorite parts of Alaska for last! 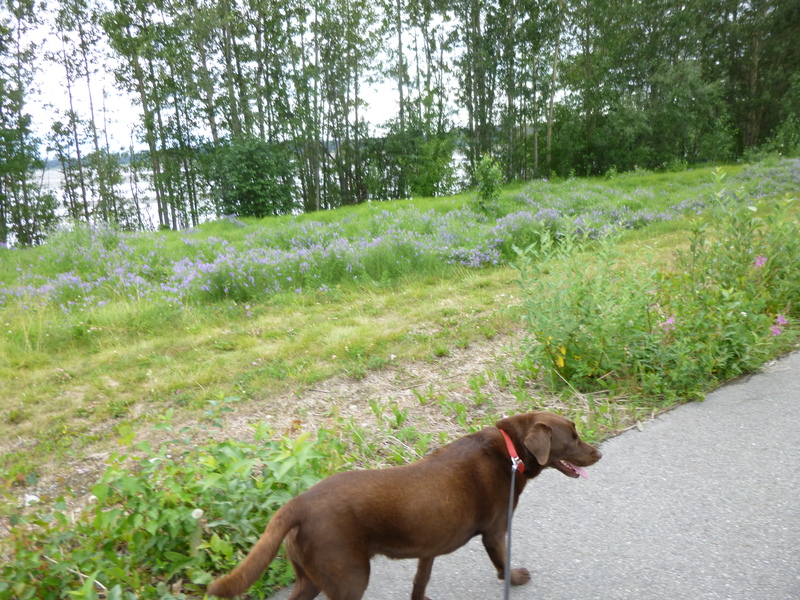 I left Palmer and as I headed through Anchorage I found a pretty neighborhood and park to walk through, and Tula and I covered about 2 1/2 miles. It felt really strange to feel the sun warm on my back at 9:30 at night! There were still some people laying on towels in the park, soaking up the warmth and reading! 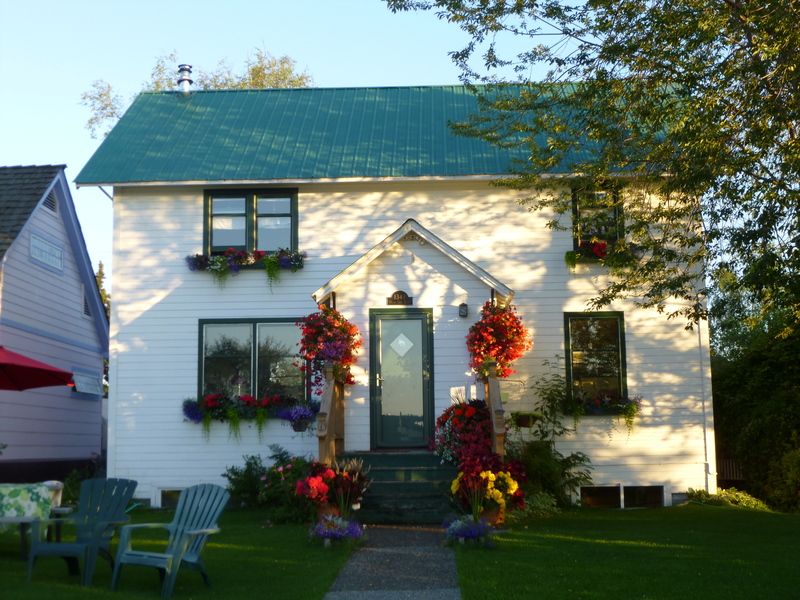 As it turned out, I walked past the oldest house in Anchorage, and also a vintage car and motor home. 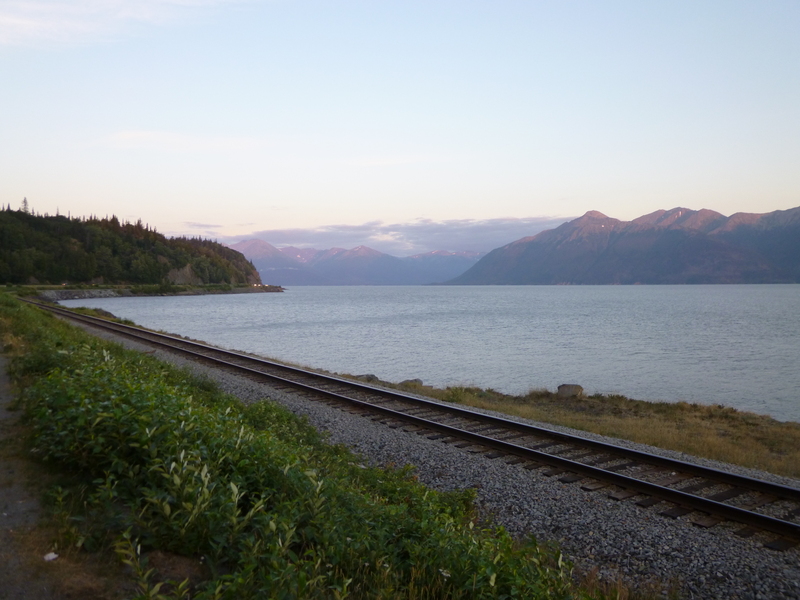 Then I continued south, taking the drive along Turnagain Bay, which I love. 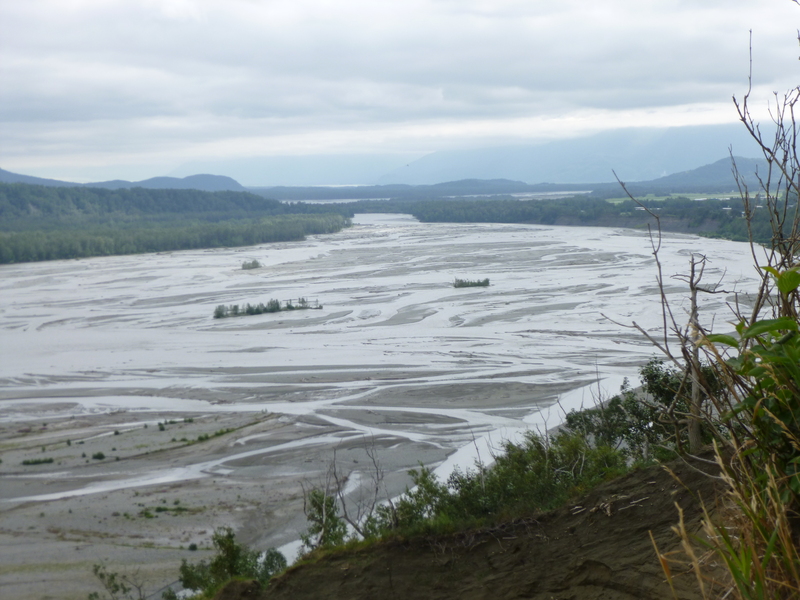 Turnagain Bay is notable for 2 things – neither of which I’ve seen (and didn’t this trip either). One of them is a “bore tide” – when the tides in the ocean change, the tides in this long narrow bay can sometimes move in at 15mph, and the waters can rise by 6-8 feet in a matter of minutes – there’s no outlet for the rising tides, and the incoming water has to go somewhere, so the effects can often be pretty dramatic. This is also an area where beluga whales are sometimes seen – the white bubble-headed whales which are related to narwhals (it would be sooooo cool to see a narwhal in the wild – but that won’t happen because I don’t ever plan to go diving in the Arctic Ocean!). 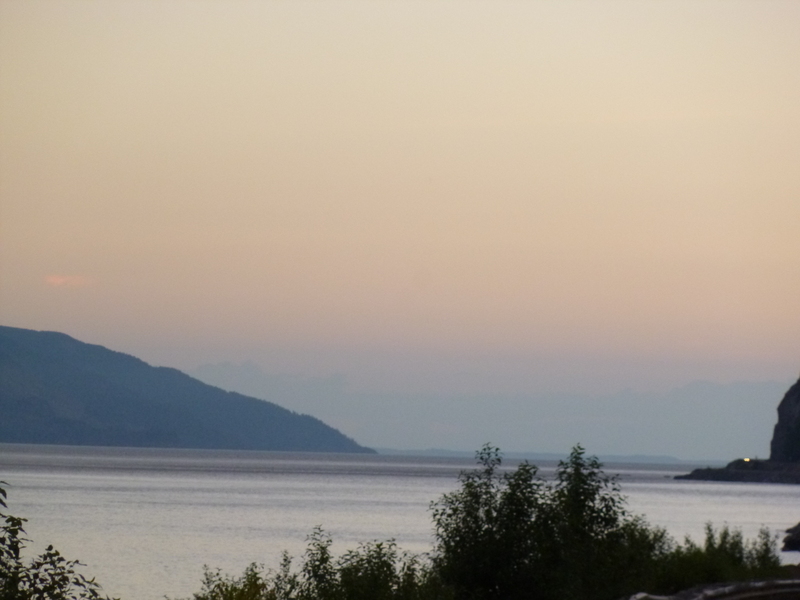 There were lots of pullouts to stop and admire the views, and it was a gorgeous drive in the pretty evening colors, which linger long after the sun has set. 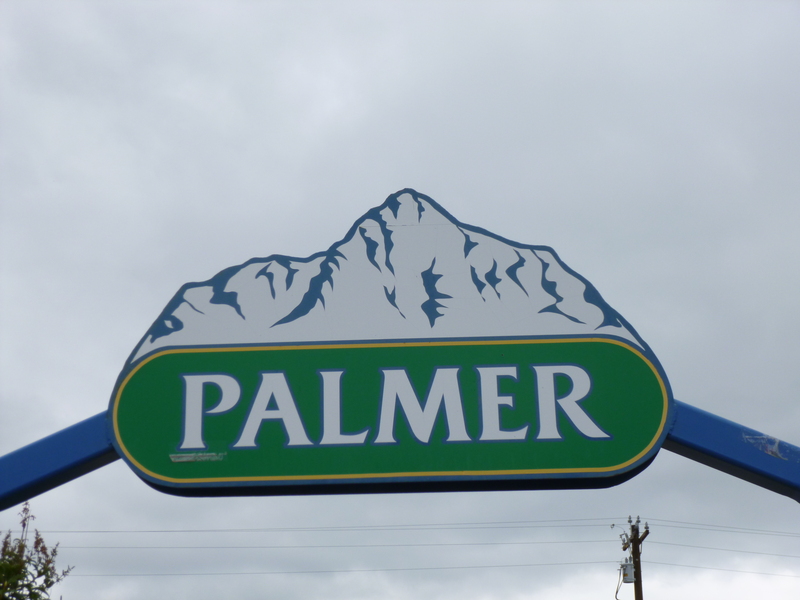 I was headed to Homer, but wouldn’t make it all the way there tonight. 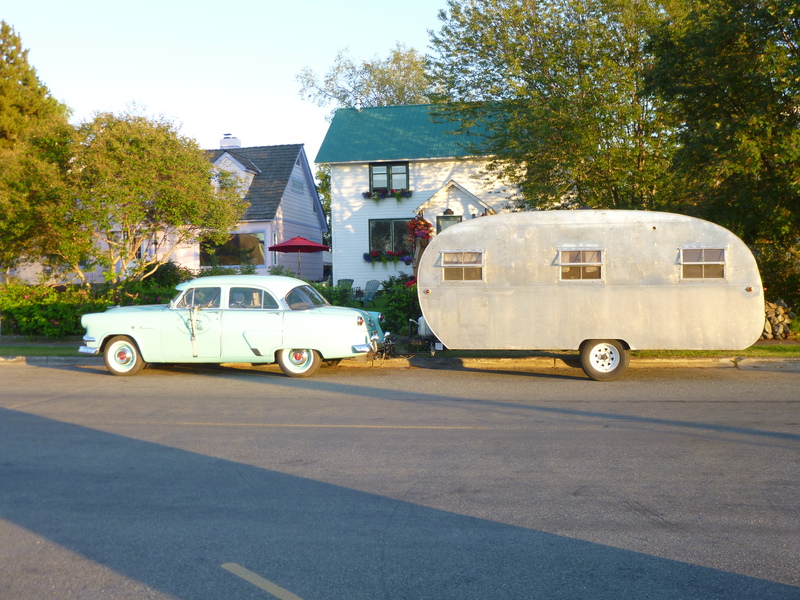 I passed a couple campgrounds along the way, but they were small, and full. 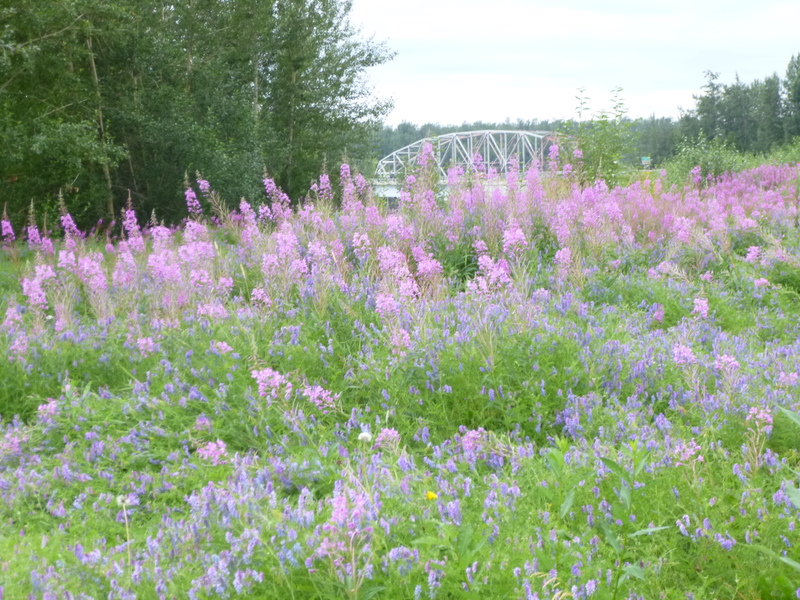 In the end, I simply stopped in a pretty pullout well off the road – there are frequently 1-2 RVs parked for the night in them, and it seems to be a perfectly acceptable thing to do in Alaska – and it’s free! This is my 3rd free night in a row, and considering I’m extending my Alaska stay by a couple days (I think Alaska deserves a couple extra days because of its size and how long it took to get up here!) I’m staying well within my budget. I’m so grateful I drove up here instead of flying – I wouldn’t have been able to camp at all if I had flown, and that would have changed the whole tone of my visit here. This is my 11th night in a row of camping.